. Published on Wednesday, March 2, 2011 . 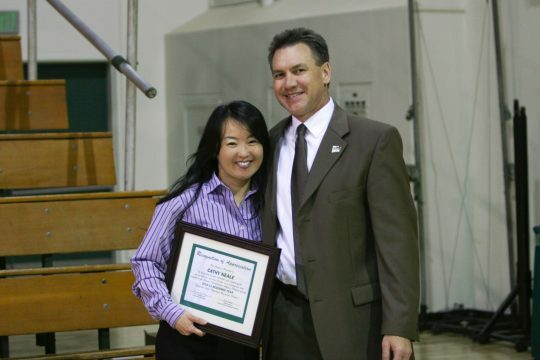 Cathy Neale accepts award for supporting intercollegiate Athletics at Cal Poly Pomona. Two of ASI’s very own staff members, Cathy Neale and Julie St. John-Gonzales, received special recognition at the Bronco Athletics Faculty/Staff Appreciation Night during halftime at the Men’s and Women’s basketball game this past Friday. 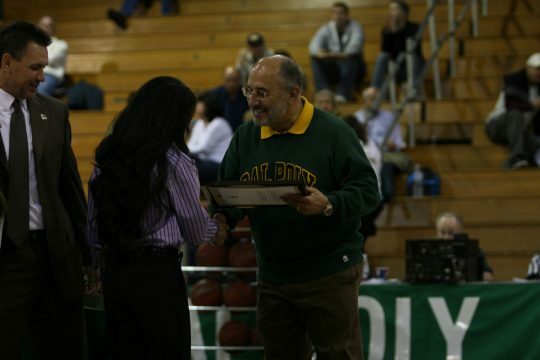 This recognition is in honor of their commitment in supporting student athlete programs here at Cal Poly Pomona. By serving as a partner, their dedication and support is an example of how Cal Poly Pomona departments cross-collaborate. “It is a privilege to support Intercollegiate Athletics in creating marketing campaigns that support the student-athlete experience and programs,” said Neale. The fun-filled packed game truly was a sight to see, and ASI is honored to have received such praise for the support we provide to the campus community.